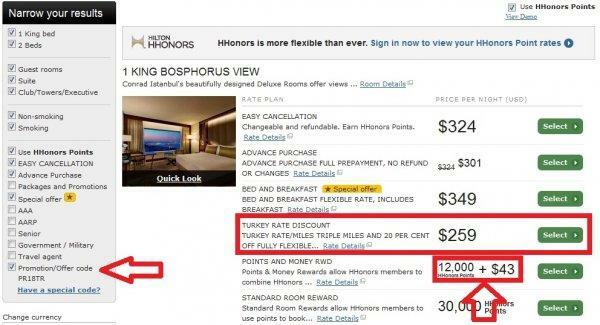 Hilton has Turkey on sale at 20% off for stays between February 10 and May 31, 2014, that are booked by March 31. Turkish Airways Miles&Smiles members are eligible to earn triple miles by booking this rate. You must book rate plan PR18TR or T8R to be eligible for the discount and triple miles. If you access Hilton.com using the sale page, the correct rate plan is already embedded to the rate search. It is easier, however, to compare all the rates if you just use the regular Hilton search (access here) and just plug in the PR18TR or T8R to the Promotional/Offer Code field. You should also check the Corporate Benefits Employee Offer (read more here) or Little League Rate (read more here) that may offer better pricing at times. In order for you to earn Turkish Airlines Miles&Smiles, you must have chosen Points + Miles Double Dip option and have selected Turkish Airlines as the partner airline. This Turkey sale rate was the lowest paid rate. I would, however, rather use the Points and Money award type that is a steal for this property. Hilton has had quite a few country/region specific sales this year and apparently more are on their way. I really like Istanbul and should visit some other cities in Turkey as well. You should check all the other discount rates and compare against this Turkey sale rate. 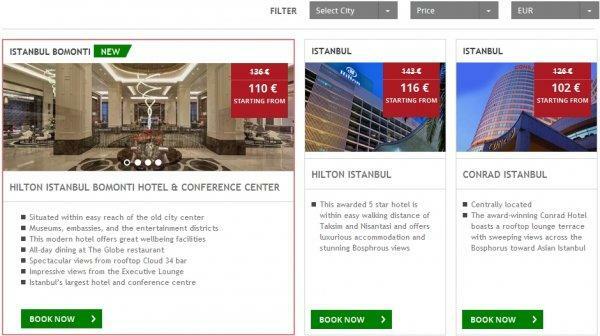 Offer up to 20% off BAR and triple miles valid for stays booked between February 10 and March 31 2014, and completed between February 10 and May 31, 2014 at participating properties in Turkey. Offer must be booked online only at www.hhonors.com/TAsale. Subject to availability. Offer requires a one night minimum length of stay. Credit card guarantee required at time of booking. Booking can be cancelled by 4.00pm local hotel time on the day of arrival. Each property has a policy addressing cancellation penalties that may apply. Featured ‘from’ rates are per room, per night, based upon single/double occupancy and are inclusive of all taxes but exclude incidental charges, gratuities, and resort fees where applicable. ‘From’ rates featured in different currencies may fluctuate based on exchange rate but are correct as of the start of the promotional period. Blackout dates may apply and vary by property. You must book the Plan Code “PR18TR” or “T8R” for Hampton by Hilton™ to receive this offer. 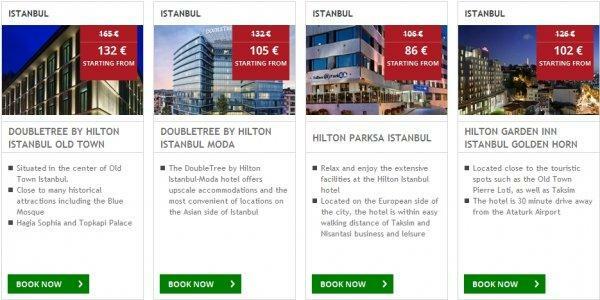 In order to earn triple miles you must be a Hilton HHonors™ member and a Turkish Airlines Miles&Smiles member. If you are not an HHonors member, register online at www.hiltonhhonors.com . To be eligible for earning Points and Miles, you must have Turkish Airlines selected as your preferred Double Dip® Points & Miles™ partner, and select Points & Miles as your Double Dip® Earning Style in your HHonors account profile prior to completion of your stay. Please click here for more details. Insert your HHonors account number at the time of booking or present your HHonors membership card at check-in to receive bonus miles. HHonors members will receive triple miles only for nights completed during the promotion period, regardless of a check-in date before the promotion period begins or a check-out date after the promotion period ends. HHonors members choosing HHonors Points &Miles award will earn 10 HHonors Base Points and 1 base mile plus 2 bonus miles per every eligible $1 USD spent. There is no cap on the miles to be awarded during the promotion period. Please allow six to eight weeks from completion of your stay for points or miles to appear in your HHonors account. Miles accrued and awards issued are subject to Turkish Airlines Miles&Smiles Terms and Conditions, available here . Please note that your contract for Miles&Smiles Miles is with Turkish Airlines and Hilton Worldwide do not accept any liability in relation to the membership scheme. Offer components are non-transferrable or redeemable for cash, and cannot be used during future stays. No credits or refunds for unused benefits. This offer is not applicable to existing reservations or group bookings and cannot be used in conjunction with any other offer.